It has taken less than a year after materials science pioneer Matrix Industries’ crowdfunding effort took off to great success, and now the shipment of its PowerWatch to initial backers has commenced. This highly sought after PowerWatch is touted to be the first device of its kind, in the sense where it is powered by the wearer’s body itself. This is the perfect demonstration of Matrix’s proprietary thermoelectric energy converter, where the energy harvesting performance of the PowerWatch can be attributed to a trio of key technical advances that are currently unmatched by existing technologies. The PowerWatch will continue to work by feeding off your body heat, ensuring that recharging your timepiece is a thing of the past. When you take off the PowerWatch, your data will be stored in memory and it goes to sleep. Put back the PowerWatch, and the timepiece will turn right back on at the point where you left it. It is capable of figuring things out up to two years in idle mode, and there is always an always-on power meter which will inform you of the amount of electricity which your body heat is producing. This is starting to sound a whole lot like the Matrix, where we humans end up as batteries for the machines. In fact, the PowerWatch is deemed to be the most accurate measure of calories burned on the market. It is made from rugged aircraft-grade aluminum, and this wearable device will be able to wirelessly synchronize with your smartphone, and performs automatic adjustments to the current time zone, tracks your steps, calories and sleep, and is water resistant up to 50 meters. PowerWatch as well as the special edition PowerWatch Black Ops will start to ship to initial backers and will be available for purchase later this month with a starting price point of $199. Expect the premium PowerWatch X slated to ship before the year comes to an end. 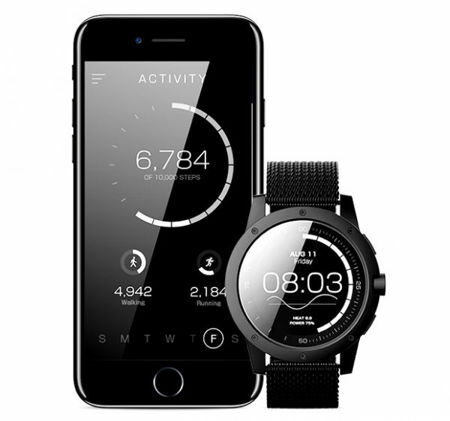 Talk about a truly different smartwatch!